The Arabian Sea and the Malabar Coast of India have conjured up magical tales since early days of civilization. So you can see why a journey to Kerala, the state in which this area lies, is on many traveler’s “not to be missed” list. Discover Cochin’s diverse culture of colonialism and its bustling harbor lined with Chinese fishing nets. Visit spice plantations. Explore Periyar and see India’s wildlife. 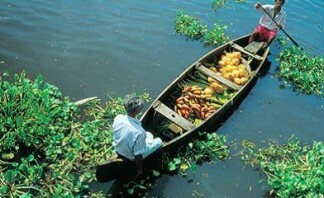 Take a boat down the backwaters and enjoy Kerala’s culture through its enchanting music. Learn to cook South Indian style. Bicycle through fishing villages. Majestic Kerala will entrance you as you discover its magic! Arrive Cochin by morning flight. On arrival at Cochin International Airport, you are greeted and whisked away to Willingdon Island. On arrival check in hotel (check in 1200 noon). Morning after breakfast, you will drive back down to the coast and this melodically named town of Kumarakom on the banks of Lake Vembanad. Here, you hop on to a boat to Coconut Lagoon, an eco-friendly resort created from restored heritage homes, set in a web of canals on the banks of the Kavanar River. Evening finds you on a sun-set cruise on the lake, in a converted rice boat adrift to a flute accompaniment. Wake-up call by the birds from the nearby bird sanctuary and get ready to experience yoga for your body and mind. After breakfast, bird watching accompanied by a Naturalist who will identify the birds which wake you up in the morning. There is enough time to visit the village nearby. Back to resort. Another session of yoga followed by breakfast. After breakfast, transfer by boat and then by road to Marari Beach. Check-in to an independent villa at the Marari Beach Resort. Marari Beach Resort is not just the sand and the sea but the living environment that surrounds it. It is a peaceful and tranquil area ideal for relaxing and getting rid of the stress from city life. After breakfast, explore the area and it’s fishing villages on a bicycle or take a dip in the sea. The beach is usually empty except for a few other guests and the odd local fishermen. In time transfer to Cochin International Airport to board the flight for your onward destination.